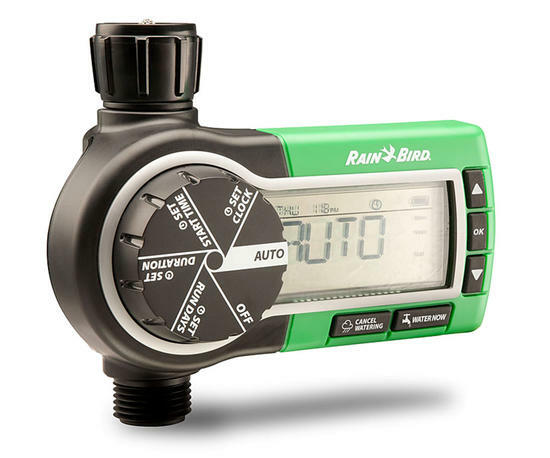 The Electronic Garden Hose Watering Timer enables you to program irrigation runs based on your needs for uses such as drip irrigation or a micro irrigation system. If you use a breather and / or pressure regulator, install them at the outlet (bottom) of this timer. To install the battery, use a firm pressure to lift the battery compartment cover in the back of the unit. Insert two AA (1,5 V) alkaline batteries and lock down the battery in place. The polarity is marked for direction. Replace battery compartment cover in its proper place, ensuring a triangle is formed on the underside of the timer. If installation is into a faucet connect the swivel female hose thread to the faucet using the swivel adapter. If the timer is installed with a drip irrigation system, make sure to add a 25 or 30 PSI pressure regulator to lower the pressure to the drip system, then install a 150 or higher mesh screen filter to protect the drip system, following with a swivel adapter to the drip tubing. After the timer has been programmed, turn the faucet on and test the timer by pressing the On button once to see the timer open and press the Off button to see it close. No other steps are needed.